Tega Industries Limited (“Tega”) is the flagship company of the Tega Group of Companies, a name synonymous with pioneering achievements in the mineral processing, mining, material handling and environment industries. It was promoted by the Mohanka Family in 1976 as “Tega India Limited” in technical and financial collaboration with Skega AB, Sweden with an objective of providing unique products and services for handling complex problems in material handling and mineral processing industries. In 1998, the Mohanka family acquired 100% equity stake in Tega. The name of the Company was changed to Tega Industries Limited in 2002. Tega Industries Limited (“Tega”) has been awarded Integrated Management System (IMS) certification by SGS India Limited. By virtue of this, Tega is now certified for three management systems, which are : Quality Management System (QMS) – ISO 9001:2008, Environment Management System (EMS) – ISO 14001:2004 and Occupational Health & Safety Management System (OHSMS) – OHSAS 18001:2007. Tega has been certified by various customers on Quality Assurance of its products. Established in 1991, Hosch Equipment (India) Ltd. is a Joint Venture company promoted by Tega and Hosch (G.B.) Ltd. Hosch (G.B.) Ltd specializes in manufacturing of Conveyor Belt cleaning systems and is headquartered in Recklinghausen, Germany. Accredited with ISO 9001:2000 certification, Hosch Equipment (India) Ltd. through its quality products and services, has firmly established its reputation in providing belt cleaning technology and solutions for belt slippage. Hosch International serves 50 countries through its 8 subsidiaries in South Africa, United States, Australia, Great Britain, India, France, Brazil, Poland and 80 distributors in different parts of the globe. The company specializes in manufacturing of Conveyor Belt cleaning systems. HOSCH is considered the expert worldwide in all matters of conveyor belt cleaning. Hosch considers itself to be qualified advisers to its customers. For more details, please visit our website here. In January 2011, Tega acquired a 100% stake in Losugen Pty Ltd.
Losugen Australia is a Perth based engineering company specialising in the design, manufacture, installation, wear monitoring and maintenance of wear liners, rubber lining, trommel screens, vibrating screens, ceramic linings and filter products for mining and materials handling industries. As manufacturers of rubber lining brands such as Aggression, D-MAC (ceramics) and Tornado (screen and mill linings), Losugen services and exports products around the globe. It is active in mining projects and materials handling industries Australia wide as well as South East Asia and Papua New Guinea. Losugen has a solid reputation for providing customised solutions, quality long wearing products and quick turn-around times from order through to installation. 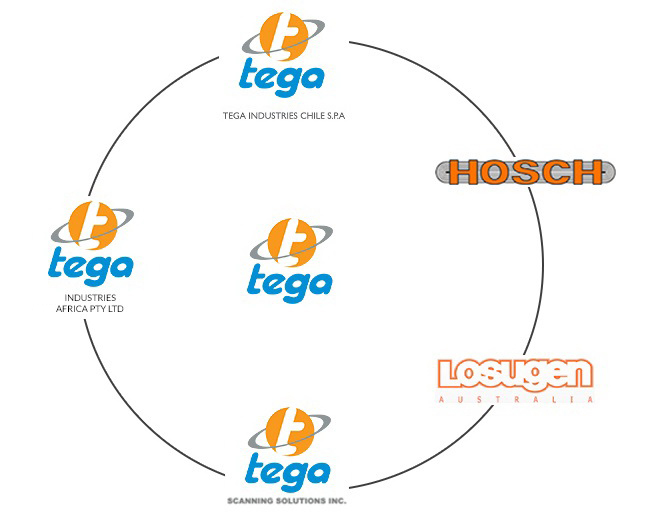 In February 2011 Tega Industries concluded its acquisition of a 100% stake in Acotec S.A a Santiago, Chile based manufacturer of Slurry Transportation, Pump, Screen Media and Wear Products. Later renamed as Tega Industries Chile SpA ,the company provides products and solutions for abrasion, wear, corrosion and fluid transportation systems in the mining industry. The company has more than 20 years of experience and offers solutions to the mining industry in Chile as well as in Peru, Argentina and Bolivia. Incorporated in 2014 ,Tega Scanning Solutions is a Canadian based services company offering premium laser scan and analysis services of ore grinding mills and wear components to the mining industry. The company specializes in wear tracking and analysis of SAG, Ball, and Rod mill liners. The use of state of the art terrestrial data collection and analysis technology is an integral part of the business. Implementation of a quality control and assurance program is also a focus for a high quality product. In South Africa, Tega acquired the specialist industrial rubber manufacturing company, Beruc Equipment in 2006. Thereby, Tega established a manufacturing presence on the continent and gained access to Africa’s thriving mining and emerging industrial markets. The industrial division manufactures products ranging from application specific mouldings, diaphragms, springs, bellows, special seals and vibration mountings to heat exchanger gaskets, cable protectors and bucket conveyor cleats. Tega Industries Limited is one of the global leaders in the design and production of consumables for the mineral beneficiation, mining and bulk solids handling industry.